When I first wrote this introduction, I described John Holyfield as a successful children’s book illustrator. However, I’ve come to realize that description comes up short. John Holyfield, first and foremost, is a caring father. 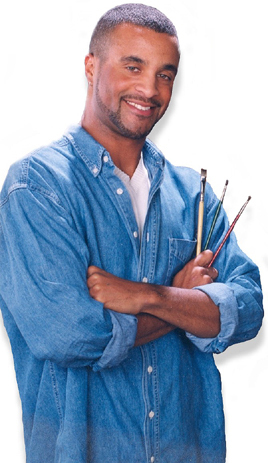 He’s a successful fine artist, a painter, a hard-working entrepreneur. And, oh yea, a children’s book illustrator, too. John’s debut picture book, The Hard-Times Jar (Farrar, Straus and Giroux, 2003), written by Ethel Footman Smothers, is richly illustrated with bold, confident brush strokes. 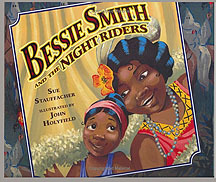 His next book, Bessie Smith and the Night Riders (Putnam Juvenile, 2006), written by Sue Stauffacher, received critical acclaim for it’s “brilliantly colored” and “striking” illustrations. But being different didn’t stop John from reaching his goals. Instead, he used those differences and his childhood memories for inspiration. Common themes in his body of work include those of family, spirituality, music. His style is southern and folksy. I remember the first time I saw Jonh’s work. It was in an African American gift shop and art gallery here in Austin, Texas. At the time, my wife and I had recently moved from Des Moines, Iowa (also a Black population of 2%) to Austin. We were homesick, and John’s artwork warmed our spirits. Standing in that art gallery some 900 miles away from Iowa, we felt at home. I’m thrilled to present artist John Holyfield. Don: What kind of training have you received to prepare for your career as a fine artist and illustrator? John: I’ve been an artist for as long as I can remember. As a child, it was the only thing I had a passion for. I took the usual art classes offered in elementary and high school. And, even then, I was pretty serious about my art. It brought me so much joy. After graduating high school, I attended Howard University and the University of D.C. to major in graphic design. Don: What is your mission as an artist? John: My mission as an artist is to capture, visually, all of the positive and beautiful aspects of being African-American. This artistic talent is “my voice”…and I feel compelled to say something. Sometimes I feel that there are so many negative images projected out there about African-Americans…yet, my experience being black contradicts all of those perceptions. Being a father of two sons, I realize the importance of imagery and the impact it can have on a young mind. So, I decided, early on, that the images I produce will be positive and uplifting. Don: What is your primary medium? I love working in oils. There’s something about the richness, texture and sheen of oils that appeals to me. Because oils dry slower, the workability of them is great. I enjoy building layers when developing a painting. I also, still, love to draw with pencil. Keeping my drawing skills sharp definitely helps my painting. Don: Talk about your process of creating a children’s book. John: Once I read through the manuscript and get a clear idea about the story line, I make a story board. The story board is laid out on regular paper as if I were a movie-director creating a film. Page by page, I take into consideration the text and try to bring that text to life, visually. I try and make the illustrations exciting by using different perspectives and compositional layouts. It’s usually at this point of the process that I determine things like, whether or not to use a full spread image, a spot image, graphic text, etc.. The sketches are relatively rough, but good enough that I get an idea of how the flow of the illustrations will go. Once I’m pleased with the layout, I create more detailed sketches and incorporate the story text into the sketched images. I, then submit the sketches to the author and publisher for review. After the sketches are approved by them, I begin the final illustrations. Don: How long does it typically take you to illustrate a children’s book, and how do you balance work, family, and other? John: Each illustration job is different. I usually work with the publisher to establish a deadline for the submission of the art work and then adjust my work schedule accordingly. Sometimes it may take six to nine months…while other jobs may take a year or more to complete. Being a father, an artist, and a business man, I’ve learned how to wear several different hats…depending on the time of day. First thing in the morning, I’m a father, helping to get my sons off to school. After a couple cups of coffee, I am a business man for the rest of the day. I attend to customers, making sure their orders are filled and shipped. Around five o’clock, I shut down the business phone lines and switch back into “Daddy” mode…and try and spend some quality time with my sons. Later at night, when everyone has gone to bed and the house is quiet, I turn on some mellow music and paint for a few hours. Don: Do you do school visits and can you speak a bit about your program? John: I used to visit schools and talk to the children about art, but lately, my art distribution business has taken up all of my time. I sell art prints to hundreds of galleries, frame shops and boutique stores across the country. I also travel throughout the year to exhibit my art. Don: Do you have any hobbies, or other interest beyond art? John: My art career is so consuming, I can’t even recall having any other hobbies or “real” interests. If I’m not painting or thinking about art, then I’m usually involved with my sons. I try and take fatherhood very seriously…so, being a good father is my hobby. I do enjoy other artistic things like music and interior design. Both inspire the visual artist in me. My resolution for this year is to do some traveling…that is not business-related. I really want to get inspired to create a new and different body of work. Don: Are you drawn to any particular kind of manuscript? 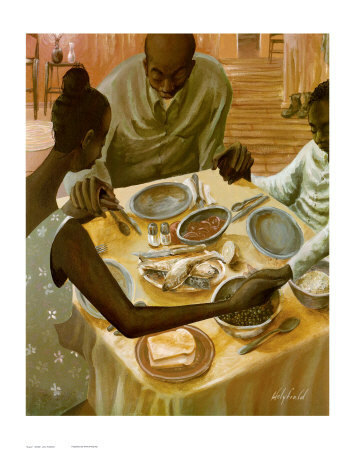 John: I love the idea of illustrating stories that are based on the lives of important black figures. Most of their stories are so inspiring and uplifting. The joy, to me, is to illustrate these tales, in a way, that captures the hearts and minds of young readers…to illustrate it effectively enough that the readers see themselves in the story. Don: As an African American children’s book illustrator myself, I enjoy illustrating on a variety of topics. Do you ever worry about being pigeon-holed into illustrating certain types of manuscripts? John: I’ve never really been concerned with being pigeonholed. I’m a spiritual person and believe that God gave me this particular talent to affect a particular group of people. And that group just happens to be African-American. Sure, much of my imagery and messages are universal..but my core audience is black. It’s very important to me what I say to them, visually. This all ties in with my mission statement. I feel that if I devote all of my energy to fulfilling that mission, then everyone, no matter what race or ethnicity, will be able to relate and respect my work. Don: Who are your favorite children’s illustrators. Why? Who are your favorite fine artists, contemporary or masters? 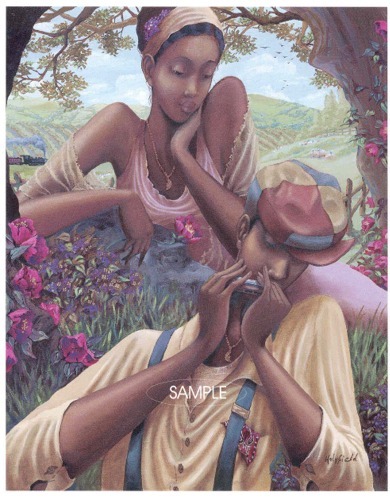 John: Currently, my favorite illustrators are Kadir Nelson, Frank Morrison and Jerry Pinkney. Nelson’s compositions are excellent. He captures the mood of each page and draws you into each image. I admire Morrison’s characters because they are so vibrant and animated. Pinkney’s work is rich with details, and I really like his use of pencil and watercolor. Through my admiration and study of art over the years, I’ve come to love all of the greats from Picasso to Rembrandt and Jacob Lawrence to Romare Bearden. I’ve taken bits and pieces from all of them and incorporated it into my own thing. But, since childhood, I’ve always admired the work of Norman Rockwell. His work captures the beauty of everyday life through his narrative style of painting. 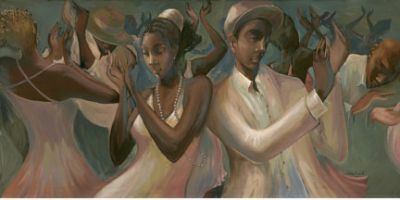 As a child, I was also fascinated with the work of Ernie Barnes. He created the images on the 70s sitcom “Good Times.” The characters in his paintings were elongated and fluid…and always seemed to be full of energy. That style appealed to me. Don: Ah, I can relate. I am inspired by that artist and image, too — The Sugar Shack. Do you use models as reference, or do you draw and paint from memory? John: I try not to use models when I create a painting or illustration. The characters in my paintings are very stylized because I paint from my mind. Often the characters are distorted, stretched and not exact. But, I feel that my style comes through best that way. Sometimes I may need to pull references for things like the details of a musical instruments or the look of a certain flower. But, for the most part, it’s all from my mind’s eye. Don: Can you talk a bit about your technique? John: When I get the initial idea for a painting, I usually draw a quick sketch on paper…just a few references lines to lay out the composition…nothing too detailed. Next I copy that paper sketch to canvas. Then I lay in big blocks of colors to establish the mood of the piece and how the colors play next to each other. Slowly I start to develop the shapes and elements of the image. Working from dark to light, I start to mold the painting and bring each object in the painting to life…adding more and more details. I usually finish with a few highlight strokes and call it quits. Don: What were your favorite children’s book as a child? John: As a child, I was big into the “How to…” books. I don’t recall the authors or illustrators. But I went to the library and checked out everything from “How to Draw a Horse” to “How to Build a Go-cart”. And, yes, my friend and I actually built one….”The Phantom Rider” I think we named it. I should have read the section about ‘installing the brakes’ alit more carefully. I was a very visual child. As long as the book had an ample amount of pictures, then I would read it. Don: Tell us about your upcoming children’s book projects? John: I’m currently working on a book entitled “The Hallelujah Flight”. It’s a charming tell of James Banning, the first African American to fly a plane across the U.S.. The book chronicles his journey and the obstacles he faces along the way. It’s a great story. I’m also working on illustrations for a book about the young life of singer Mahalia Jackson. Don: Thanks for your time! nice interview Don! John, I enjoyed reading more about your work and process. I found it interesting how you divide up your day bet. daddy duty, business and art production esp. since we just became a family of four. I love your family scenes! congrats on the interview! Thanks, Sean. These interviews have been a lot of fun. As an artist, I’ve especially enjoyed “chatting” with the illustrators. Although we walk very different paths, as artists/fathers/business people, we all have so much in common. Thanks too for your interview (on Feb. 5th). As per our webstats since yesterday, yours has been one of the most popular. Wonderful interview! I admire John’s commitment to being a caring father and artist. John, keep up the beautiful work. I look forward to working with you. Great Interview with wonderful review pictures. I am learning illustration works for children books. The interview inspired me a lot. Thanks for the efforts. Subscribed to RSS feed.